Source: Thomsom Reuters Datastream. Data are expressed in basis points. Source: Thomsom Reuters Datastream. 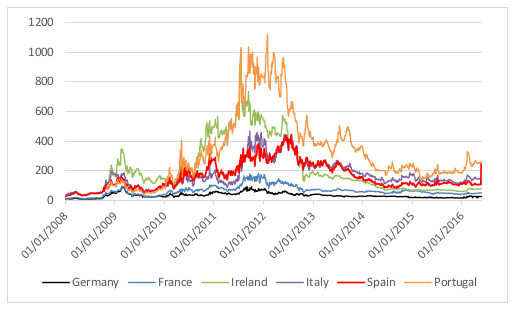 Data refer to averages of 5-year credit default swaps on banks from each country. Data are expressed in basis points. in each country. Data are expressed in percentage points. 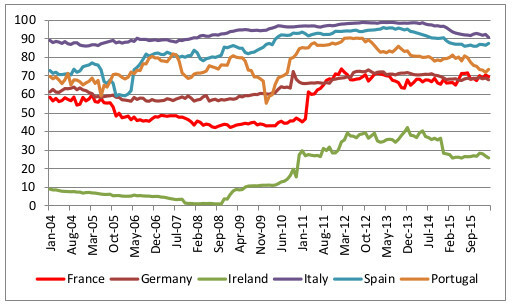 Source: ECB. 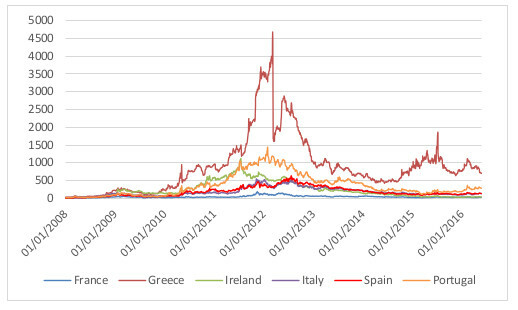 Ratio of the holdings of domestic sovereign debt and total assets by MFIs in each country. Data are expressed in percentage points. Non-stressed countries are Austria, Belgium, Finland, France, Germany, and the Netherlands; stressed countries are Greece, Ireland, Italy, Portugal, and Spain. 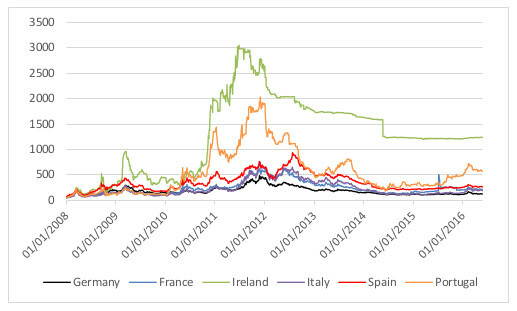 Source: ECB. Data are expressed in percentage points. Source: own elaborations on ECB data. 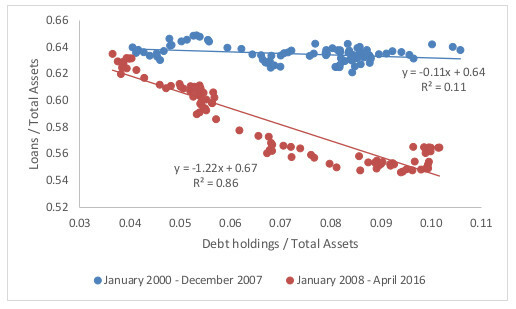 Correlation between monthly ratios of MFIs’ loans to total assets and sovereign debt holdings to total assets. 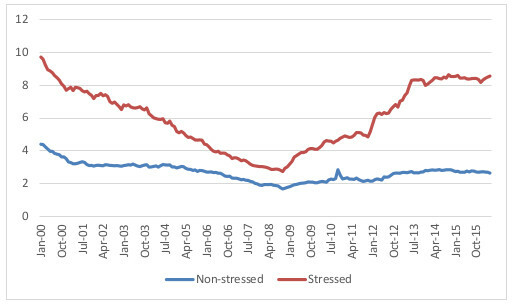 Stressed countries refer to Greece, Ireland, Italy, Portugal, and Spain. 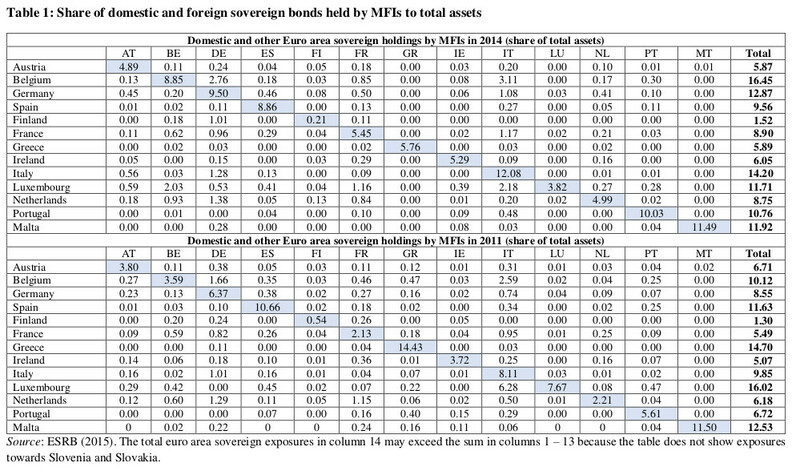 Source: own elaborations on ECB data. 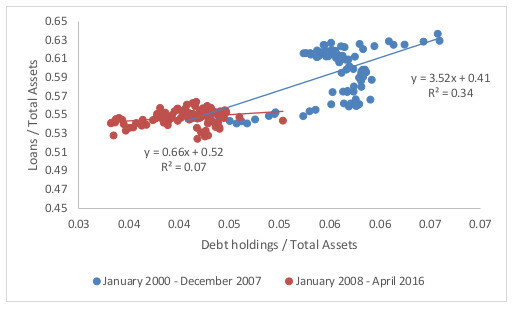 Correlation between monthly ratios of MFIs’ loans to total assets and sovereign debt holdings to total assets. Non-stressed countries refer to Austria, Belgium, Finland, France, Germany, and the Netherlands.